This year, tax reform will continue to be a topic of discussion. Part of these discussions will undoubtedly be plans to lower the corporate income tax rate, which is currently 39.1 percent, the highest among the OECD countries, by closing “loopholes.” Proposals may look to alter the way capital investments are treated in the tax code by lengthening asset lives, which would reduce the amount businesses can deduct from their taxable income for capital investments as a trade for a lower corporate tax rate. In other words, this plan would boost corporate taxable income, thereby offsetting the amount of revenue lost by a corporate rate reduction. This trade-off between lower corporate tax rates and longer asset lives is not unprecedented. The United Kingdom is one country that made this trade in the past. Although the United Kingdom has lowered its corporate tax rate by more than 25 percentage points over the past thirty years, it has also lengthened its depreciation schedules. As a result, the United Kingdom did not experience the expected benefits from a lower corporate tax rate. In fact, levels of investment declined in the country and were the lowest in the OECD in 2012. This decline also likely disproportionately affected the United Kingdom’s manufacturing industry and its manufacturing-centered northern regions. Any plan for reducing the corporate income tax rate in the United States should use the experience of the United Kingdom as a lesson in what not to do. If lawmakers in the United States are looking to enact a corporate rate reduction as a part of tax reform that significantly boosts economic growth, it would be wise to do so without lengthening depreciation schedules. 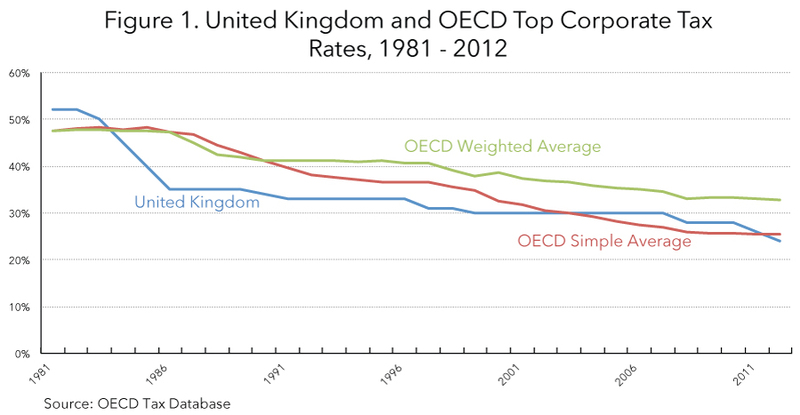 During the past three decades, the United Kingdom has kept its corporate income tax rate competitive with the OECD, dropping its rate from 52 percent in 1979 to 24 percent in 2012 (Figure 1). The first reduction in the corporate tax rate was a series of substantial cuts between 1984 and 1987, when the rate went from 52 percent to 35 percent. The rate was cut three times in the 1990s from 35 percent to 30 percent. In the 2000s, the rate was reduced further to 28 percent in 2008 and to 24 percent in stages between 2010 and 2012, with plans to cut the rate to 20 percent by 2015. In 2012, its rate was the 23rd highest rate of the 34 OECD countries. While the United Kingdom lowered its corporate income tax rates, it traded them for worse depreciation schedules for capital investments. 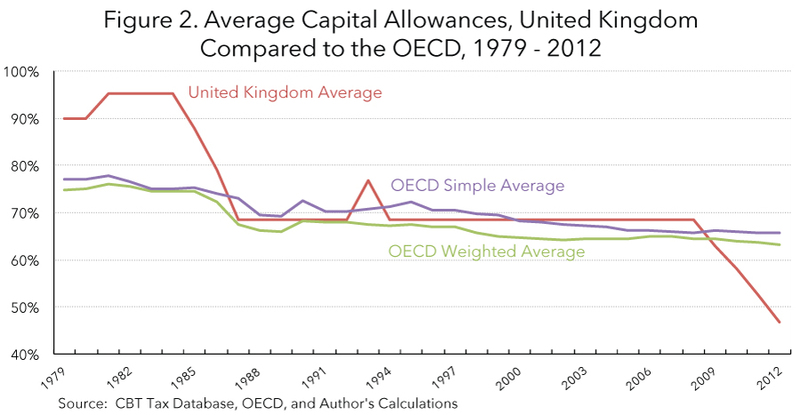 In the early 1980s, the United Kingdom had relatively good capital allowances compared to the OECD, allowing an average of 95 percent of a capital investment to be written off (Figure 2). In the 1980s, after lowering their corporate income tax rate, the United Kingdom altered its asset lives and lowered the present value of the capital consumption allowances to 66.4 percent of the cost of the assets. In 2008, they further worsened capital allowances to an average present value of 47 percent of cost, along with further reductions of the corporate income tax rate. According to research by Michael P. Devereux of Oxford University, even while the corporate income tax rate has declined in the United Kingdom, the effective marginal tax rate on corporate investment has actually increased due to these recent changes to cost recovery. In 2012, the United Kingdom had the second worst average capital allowances in the OECD, ahead of only Chile. One benefit of lowering the corporate income tax is its positive effect on investment and economic growth. Lowering the cost of capital increases the desired capital stock, boosting investment until the higher capital stock is achieved. Therefore, it stands to reason that lowering the corporate income tax rate in the United Kingdom would have resulted in higher levels of investment. However, it is not clear that investment in the United Kingdom responded positively to lower corporate income tax rates. 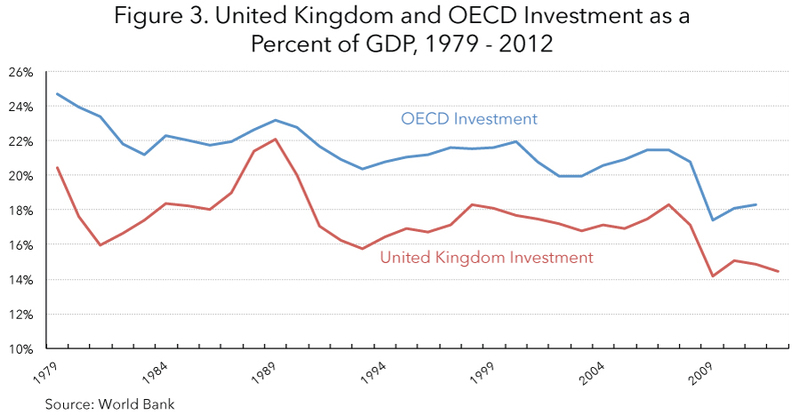 Figure 3 compares the United Kingdom’s investment as a percent of GDP to the OECD from 1979 to 2012. As the chart shows, investment in GDP in the United Kingdom during this period (an average of 17.4 percent) has consistently lagged behind the OECD average (an average of 21.3 percent). As of 2012, the United Kingdom had the lowest level of investment as a percent of GDP among the 34 countries of the OECD. Investment didn’t increase with the lower rates, but rather trended down, likely due to the United Kingdom’s worsened capital allowances. Changes in capital consumption allowances do more than affect the level of investment in an economy. They can also distort the relative prices of different investments and alter the mix of capital, leading to disparate impacts on different sectors of a nation’s economy. While it is true that manufacturing in the United Kingdom had been in decline for decades, the changes to the U.K. capital allowances in the 1980s, which specifically lengthen the assets lives of machinery and industrial buildings, likely hastened the manufacturing decline. In the 1980s, the present value of machinery capital allowances declined from 100 percent of cost to 82.7 percent and industrial buildings declined from 94.4 percent of cost to 47.9 percent. Following this, the United Kingdom experienced a decline in manufacturing which surpassed the decline in other developed nations. Table 1 shows the annual growth rate of gross capital stock for manufacturing machinery in the United Kingdom for different periods compared to other major economies. In general, the growth in the capital stock of manufacturing has declined across all five major economies during these four periods, declining from an average growth rate of 7.2 percent per year between 1964 and 1979 to an average growth rate of 1.6 percent between 1989 and 2007. However, the table shows that the decline was particularly severe in the United Kingdom since the 1980s. Between 1980 and 1989, the gross capital stock of manufacturing in the United Kingdom did not grow and even declined for structures by an average of 0.05 percent per year. For the period of 1989 to 2007, the growth in the United Kingdom’s manufacturing gross capital stock was half the rate of the average across these five countries. It is also worth mentioning that this decline in manufacturing has had a disproportionate effect on the northern regions of the United Kingdom. Table 2 compares the employment and output growth by United Kingdom region between 1992 and 2007. According to analysis by economists in the United Kingdom, employment growth and output in the historically manufacturing-centered north was half that of the service sector-centered south in the last fifteen years. They also found that the north grew more slowly than the United Kingdom as a whole. While it is important for lawmakers to lower the United States’ corporate income tax rate to keep U.S. corporations competitive, it matters how they do it. Plans that would swap a lower statutory tax rate for longer asset lives risk harming investment in the U.S. economy, especially among capital-intensive industries. The experience of the United Kingdom in the past three decades highlights these risks. Even though they lowered their corporate income tax rate by a substantial amount, the offsetting lengthening of asset lives reduced or eliminated the benefit of the cut and likely contributed to the decline of its manufacturing industry. Source: Michael Kitson & Jonathan Michie, The Deindustrial Revolution: The Rise and Fall of UK Manufacturing, 1870-2010 (Oct. 2012) at Table 3, http://michaelkitson.files.wordpress.com/2013/02/kitson-and-michie-the-deindustrial-revolution-oct-20121.pdf. Source: Ben Gardiner, Ron Martin, Peter Sunley & Peter Tyler, Spatially Unbalanced Growth in the British Economy, 13 Journal of Economic Geography 889-928 (2013). Organisation for Economic Co-operation and Development, OECD Tax Database, http://www.oecd.org/tax/tax-policy/tax-database.htm. A recent plan to alter capital consumption allowances for the purposes of lowering the tax rate came from the Senate Finance Committee. See Press Release, Senate Finance Committee, Baucus Works to Overhaul Outdated Tax Code (Nov. 21, 2013), http://www.finance.senate.gov/newsroom/chairman/release/?id=536eefeb-2ae2-453f-af9b-946c305d5c93. See OECD Tax Database, supra note 1. This means that the present value of the capital allowances equaled 95 percent of the initial cost of the investment. The average capital allowance in the United Kingdom is the weighted average of the present discounted value of depreciation schedules for machinery, industrial buildings, and intangibles. Discount rate plus inflation equal to 7.5 percent. Data on depreciation schedules is from the CBT Tax Database, which can be found at http://www.sbs.ox.ac.uk/ideas-impact/tax/publications/data. Oxford University Centre for Business Taxation, Katarzyna Bilicka & Michael Devereux, CBT Corporate tax ranking 2012 (June 2012), http://www.sbs.ox.ac.uk/sites/default/files/Business_Taxation/Docs/Publications/Reports/cbt-tax-ranking-2012.pdf. 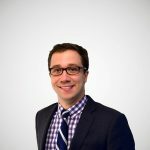 Kyle Pomerleau, Cost Recovery across the OECD, Tax Foundation Fiscal Fact No. 402 (Nov. 19, 2013), https://taxfoundation.org/article/capital-cost-recovery-across-oecd. In a literature review, Kevin Hassett and Glenn Hubbard found that “a consensus has emerged [among economists] that investment demand is sensitive to taxation.” See Kevin A. Hassett & R. Glenn Hubbard, Tax Policy and Business Investment (April 10, 2001), http://www.aei.org/files/2002/03/31/20030122_rahass0204.pdf. World Bank, Gross capital formation (% of GDP), http://data.worldbank.org/indicator/NE.GDI.TOTL.ZS. World Bank data is only available up to 2011 for the OECD average. According to recent research on the Jobs and Growth Tax Relief Reconciliation Act of 2003, which found that “bonus depreciation had a powerful effect on the composition of investment” in the United States. See Fundamental Tax Reform: Issues, Choices, and Implications 206 (John W. Diamond & George R. Zodrow eds., MIT Press 2008). Ben Gardiner, Ron Martin, Peter Sunley & Peter Tyler, Spatially Unbalanced Growth in the British Economy, 13 Journal of Economic Geography 889-928 (2013). CBT Tax database and author’s calculations. Michael Kitson & Jonathan Michie, The Deindustrial Revolution: The Rise and Fall of UK Manufacturing, 1870-2010 (Oct. 2012), http://michaelkitson.files.wordpress.com/2013/02/kitson-and-michie-the-deindustrial-revolution-oct-20121.pdf. See Gardiner et al., supra note 13.